This article will show you how you can open a jQuery message open as modal dialog box in asp.net without refresh with ok button. In this I have used jQuery ui top open the dialog box using jquery on click of asp.net button. Some of my previous articles are as follows: jQuery DatePicker Calendar With Slide Down and Slide Up Effect In Asp.Net, Shopping Cart Example to Drag and Drop Item in Cart In Asp.Net MVC Using jQuery, jQuery Ajax Cascaded DropdownList in Asp.net MVC Using C#.Net, Password Strength Validation in Asp.net MVC Using jQuery, Bind jQuery DatePicker Calendar In MVC WebGrid and Retrive Value Using Asp.net MVC, C#.Net, Resizable Gridview Using jQuery in Asp.Net. 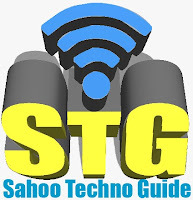 So for this article first we will create a new asp.net application and add the below reference in our page header. Now add the below mention code into your page. For preventing the refresh I have written return false at the end of the function. Now we will add a div control and an asp.net button control and call the jQuery function on onclientclick event of the asp.net button. Now merge all the code your page code will look as shown below. 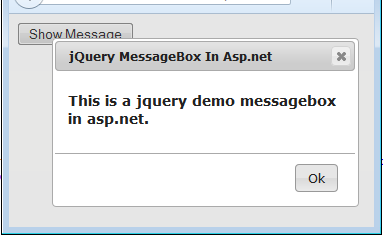 This is a jquery demo messagebox in asp.net.